We exchanged a few tweets about how my tweet wasn’t directed to @savethevikesorg, but was about their ongoing campaign for corporate welfare. Now, take another look at the above screenshot. See anything else going on there? Check out the name associated with the Twitter account in the bottom two tweets vs the top two tweets. Yes, during our conversation on Twitter, this Twitter user changed their name from Josh Hewitt to Jeremy Woods. In the end, building a new stadium is an investment we have to make. 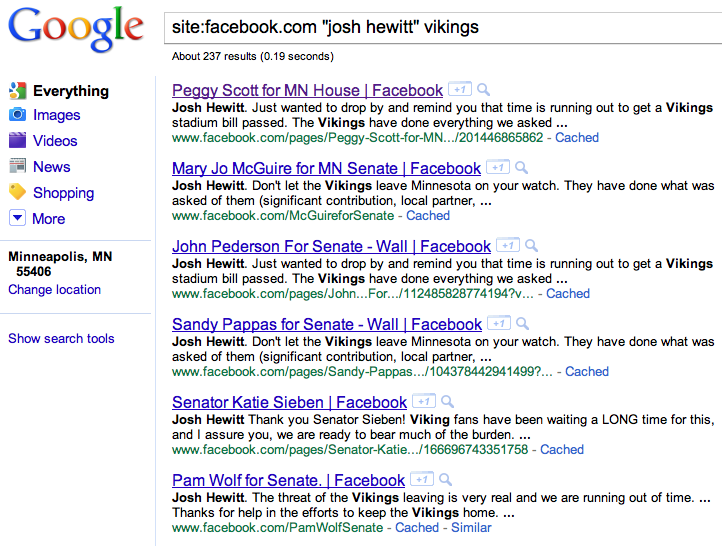 We must keep the Minnesota Vikings in Minnesota. It is essential to our economy. And a priceless investment in our community. We “have to” spend public dollars to supplement the capital costs of a private business? No, Josh, we don’t. Also, it’s interesting to note that this same Josh Hewitt is @vikesstadium on Twitter. 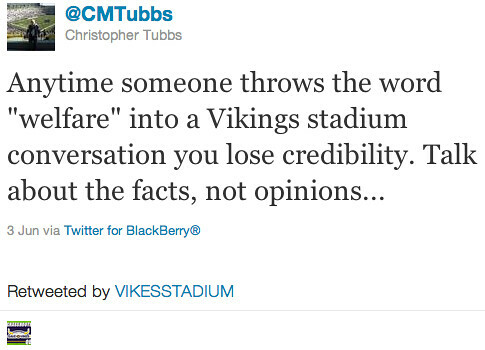 This is the guy who, when attempting to tweet anonymously, said he was against public financing for a stadium. 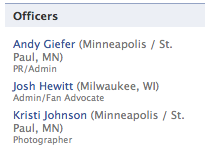 Coincidentally, one of the Officers on the Save The Vikings Facebook Group is, you guessed it, Josh Hewitt. As you can probably imagine, that tweet did not receive a response. 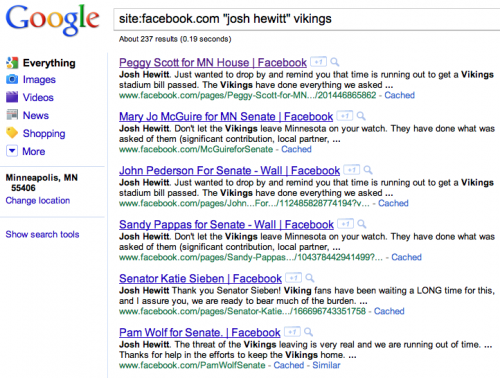 Sadly, it appears that the Save the Vikings stadium welfare supports is willing to turn to deception to attempt to suppress opposition to their handout. I guess when a rational argument in favor of public financing of a depreciable asset for a private company can’t be made, one may be desperate in support of their personal want (not need). Here is the deal: if you’re asking for corporate welfare, it’s welfare. If you don’t like the label, don’t ask for government funds for your private sports entertainment business. Don’t try to pretend that the label doesn’t fit. In reality, welfare isn’t a strong enough word to describe giving public dollars to a private, wealthy, entertainment business. True welfare helps people that are REALLY IN NEED, not people who are REALLY IN WANT. A more accurate term to describe the Save the Vikings plan is “Fiscally Irresponsible”.